Is it possible to plug in a lapel mic into an iPhone 6 so that a phone conversation can use a lapel mic instead of the iPhone mic, while the other side of the conversation is streamed into MFi hearing aids? My wife has new Widex Evoke 440’s and it is difficult for her to hold the phone for very long. We have tried the Widex COM-DEX bluetooth device around her neck and performance is poor as it frustrates the caller since volume is very low and sound quality much below that of the internal iPhone mic. I have tested her comdex by calling her from different devices at maximum volume on my end and what I hear is low amplitude and clarity (my hearing is normal). If an external mic is plugged in, will iOS treat the mic ONLY as a mic or will the jack cause it to think it is a headphone+mic? The behaviour I am looking for is mic only while at same time the phone will stream either music or more importantly her caller’s voice into the hearing aids. I’ve tried to test an old set of earbuds (with mic) by cutting off the buds and retain only the mic but it appears that the 3.5mm plug when inserted into the phone jack physically tells iOS that headphones are being used. Anything that can be purchased to accomplish the above objective or some safe DIY workaround? I wonder if a possible solution is to set the iPhone to speaker phone mode, and then override that to send audio to the HA’s? Seems to me that in speaker phone mode, the microphone must have a longer range. There seems to be an option to default to speaker phone and also another setting to “always hearing devices”. 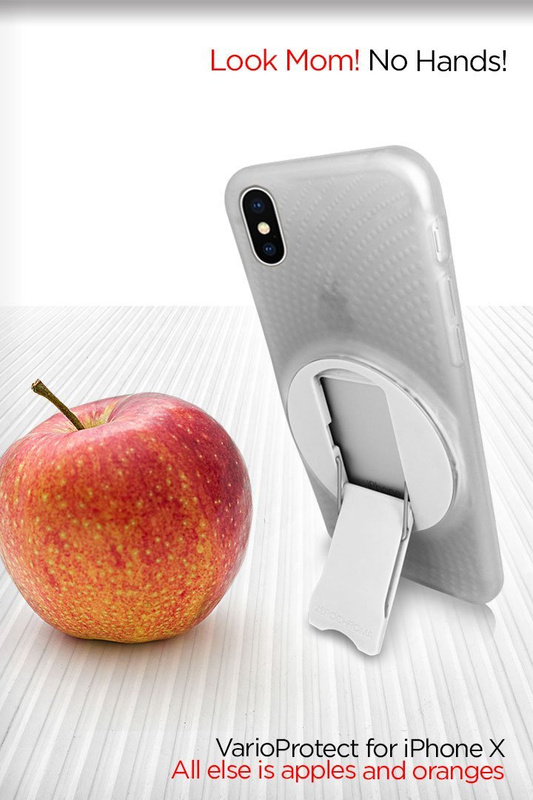 I have used this case for years on my iPhone 6 to eliminate having to hold the phone to speak into the mic while the caller’s voice streams to my Hearing aids. The stand rotates 360 degrees so I point the mic up toward my mouth. Usually it sits next to my computer keyboard. ZeroChroma iPad & iPhone accessories, cases, stands, and mounts, with patented technology. Products designed to adapt to fit every part of your day. I recently bought the Halo Effect mount for a new phone after I accidentally destroyed my iPhone 6. I could not live without the stand for using the mic for calls. I also have one for my iPad. Great company with great service. There are $5 mics on eBay and Amazon you could try. I think the iPhone would require a trrs Mic. I don’t think it will work though. This Youtube video shows how to use an external lapel mic on iPhone 6. I have Unique hearing aids. I used the Com-Dex quite a lot without the issues you are talking about but much prefer the Uni-Dex in spite of the wire; I need hands-free as well. The Com-Dex uses up phone battery a lot. I had it drop out a number of times for some reason I never figured out. In your case, I’d bet that there is competition between Com-Dex and the direct iPhone connectivity. The direct direct connectivity may be superseding the Com-Dex connection with input and/or output. The voice may be coming from the phone mike a distance away rather than the Com-Dex mike. I love the Uni-dex. Reliable. Lasts a long time between charges. The cord is not robust, though. I had to replace my Uni-Dex because the cord casing wore through. If an external mic is plugged in, will iOS treat the mic ONLY as a mic or will the jack cause it to think it is a headphone+mic? It would normally be able to tell the difference between headphone, headset, and Mic. I’m guessing that MFi is not set up for that, but I don’t know. Someone (how about you) needs to buy a cheap trrs Mic and try it, and report back. I have both the UNI-DEX and the COM-DEX and I agree the UNI-DEX is flawless for connectivity. I use it on all my Android devices and my iPad. Try the UNI-DEX corded device. It should solve the mic issue as it has its own. I’ve used it for a while now.